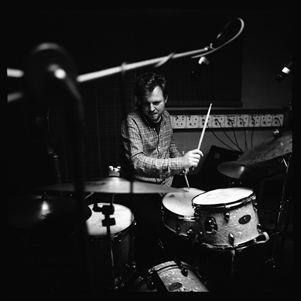 Tymek Jozwiak is one of the busiest drummers based in Birmingham, UK. He works predominantly in the field of jazz and improvised music but is also involved in folk and early music projects. While a student at the Birmingham Conservatoire, Jozwiak has been awarded the Tony Levin Drum Prize by the legendary British jazz drummer himself. Tymek is currently working with some of the finest musicians and band leaders in Britain including Mike Fletcher and Olie Brice (Fletcher/Brice/Jozwiak), Sid Peacock ( Surge Orchestra, Peacock/Angell Band), Steve Tromans (Axis Point) or David Austin Gray (One Many People, Little Church). He has worked with Tony Kofi, Paul Dunmall, Mark Sanders and Iain Ballamy. With K'antu Ensemble he appeared live on the Radio 3 programme "In Tune". He has performed at many clubs and festivals across the UK and Europe including Cheltenham Jazz Festival and most recently the Prague Jazz Festival as part of a tour across Czech Republic and Slovakia.